An approximately Euclidean representation of the visible scene can be obtained directly from a time-of-flight camera. An uncalibrated binocular system, in contrast, gives only a projective reconstruction of the scene. This chapter analyzes the geometric mapping between the two representations, without requiring an intermediate calibration of the binocular system. The mapping can be found by either of two new methods, one of which requires point correspondences between the range and color cameras, and one of which does not. It is shown that these methods can be used to reproject the range data into the binocular images, which makes it possible to associate high-resolution color and texture with each point in the Euclidean representation. The extension of these methods to multiple time-of-flight system is demonstrated, and the associated problems are examined. An evaluation metric, which distinguishes calibration error from combined calibration and depth error, is developed. 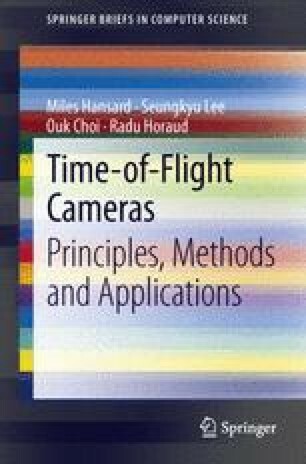 This metric is used to evaluate a system that is based on three time-of-flight cameras.